~~~Side note: Vince McMahon failed to make payments to the Hart Family and the deal was never finalized. 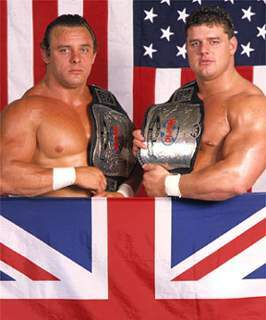 Davey Boy Smith and Dynamite Kid would become known as the “British Bulldogs” and managed by Capt. Lou Albano. Late 1986: The Dynamite Kid severely injured his back, so they needed a plan to get the titles off the Bulldogs. May 2, 1987 – SNME: The British Bulldogs defeated The Hart Foundation (WWF World Tag Team Champions). ~~~The Bulldogs won the 2/3 Falls match in two straight falls but since the first was by disqualification the titles did not change. ~~~Team #2: Demolition, The Hart Foundation, The Bolsheviks, The Islanders and Dream Team II (Team #1 WON). ~~~WWF President Jack Tunney would later announce that the Islanders were suspended until Matilda was found! January 25, 1988: The Islanders defeated The British Bulldogs by disqualification when the bulldogs used a leash as a weapon. April 30, 1988 – SummerSlam: Demolition (Ax and Smash) defeated The British Bulldogs by disqualification to retain the Tag Team titles. ~~~~The Rougeaus were eliminated early, so they could get backstage and leave the building as fast as possible. Davey Boy Smith had trademarked the “British Bulldog” without consulting with Tom Billington.